It seems the holidays are already upon us. 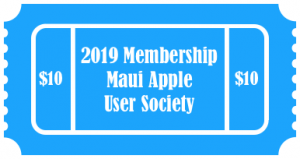 Let’s start off the long weekends, those cold Maui nights (in Kula) with some great Apple sharing and networking. Our meeting this month is Wednesday prior to Thanksgiving. Our topic this month: Preparing for the holiday season with your Apple products. We will review making gift cards and calendars with iPhoto, sharing special video moments with iMovie, sharing those special moments on your iPad or AppleTV, and where to find great deals and other great Apple related gift ideas.